What do a Tesla, a driver, and approximately fifty dollars have in common? Tesloop. A new concept in transportation service, providing a feel good experience for passengers looking to travel between Los Angeles/Palm Springs and Los Angeles/Las Vegas. The startup, headquartered in Santa Monica, is paving the way to be a passenger in a Tesla. This could be the future of transportation. Why? With autonomous driving, rising airfare costs between cities such as Los Angeles and Palm Springs, and zero emissions, the environmentally-friendly service is affordable and identifies with the health conscious. (Think about the amount of jet fuel being pumped into the atmosphere on the short commuter flights.) Tesloop is making a statement and possibly setting a new standard in Southern California. Starbucks sells skinny lattes for the calorie counters, so why not sell a car service that reduces carbon footprint in style? The eighteen month year old company was the creative genius of seventeen year old Haydn (pronounced Hy-Den). It started when he begged his father, Founder and CEO of Tesloop, Rahul Sonnad, for his own Tesla. His father agreed, if he would get a job to pay the lease payment. Haydn discovered a loophole in Tesla’s lease, and learned if he was not satisfied with the car, he could return it in thirty days. What did he do? He got to work. He started offering to drive people from Los Angeles to Las Vegas. Demand increased through word of mouth and Haydn made his first lease payment. So, the father and son attended the Tesla shareholders meeting in June of 2016, where autonomous driving and vehicle safety was on the prioritized list of questions for Elon Musk. During their drive home, Tesloop was born. Today, the company operates three Teslas with daily scheduled service between Los Angeles — Palm Springs and Los Angeles — Las Vegas. I have to say, it is quite the experience. 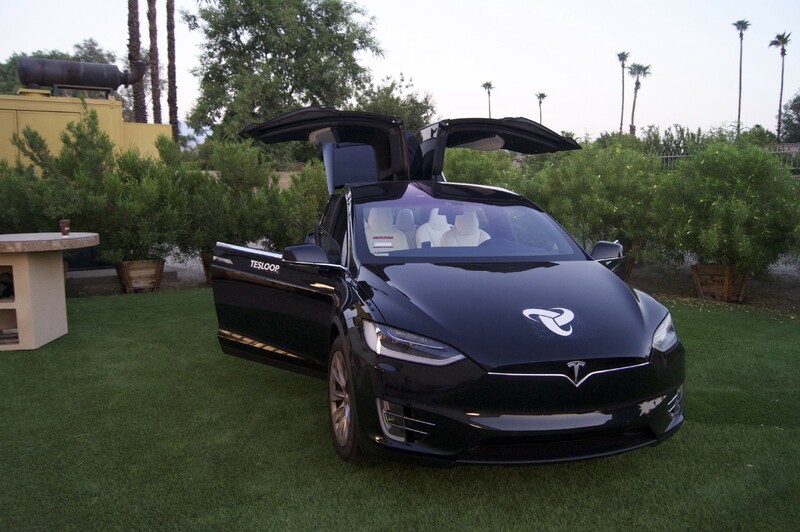 I rode in the the falcon-door Tesla X which picked me up at the Century Sheraton at LAX and dropped me off at The Saguaro Hotel in Palm Springs. Not only was it fun to ride and take selfies in a Tesla, it opened the door to conversations about technology and the environment. The Tesla Model X can drive 250 miles per charge, along with accelerate, brake and steer for itself. Complete with radar, sonar, a front facing camera, and a medical grade air filter, the fully electric zero emission car is the car of right now. Tesloop’s service is comfortable, offering drinks and healthy snack bars, phone chargers, streaming music, and travel pillows. Booking Tesloop is easy. Visit their website, select your city, pick-up location, time, and date, then choose the seat you want to sit in for your ride. Checkout, and pay. It is that simple. Thirty minutes prior to your pick-up, you will receive a text from your personal trip concierge letting you know when the Tesla will arrive and who your driver is. Tesloop arrives, you hop in and get a rundown on how the car works, and off you go! It is a very personable experience. I admit I was slightly skeptical to ride in a car with a driver and people I did not know. However, I wanted to ride in a Tesla (after all they are cool!). I enjoyed my fellow riders and drivers, plus headphones are available if you want some solo time. The best part, I believe the passengers aIl felt a common connection, as though we were apart of an insiders club. This service is not for everyone. If you are on a time crunch to get somewhere, it may not be the best option for you. Sometimes Tesloop will have to stop for a charge. It’s not inconvenient, as you can grab a coffee or drink, however it could add time to your travel plans. The company has future plans for an app that will keep you in the know about travel times and your reservation. This could cut down on some of the guessing. Tesloop is an experience and the company is focused on providing a great passenger experience. Operations Director, Tom Mourmouras (I’ve nicknamed him Tesloop Tom), often picks up driving routes to stay connected to the passengers and how the company can best serve its clientele. With five new Tesla cars on order, Tesloop plans to expand service to Santa Barbara and San Diego this spring, and hopes to expand to Seattle, Portland and San Francisco in the future. As autonomous driving technology is perfected, the company may be able to sell the driver’s seat as an experience. I think James Corden needs to book Tesloop for a carpool karaoke session when this happens… Can I join? Life Without a Car in Los Angeles.